I am little bit into this project already, but a monthly pledge thread gave me the desire to start full blog on my progress. What I want to do is have the elements to use Kill Team to play Lost Patrol like setups. 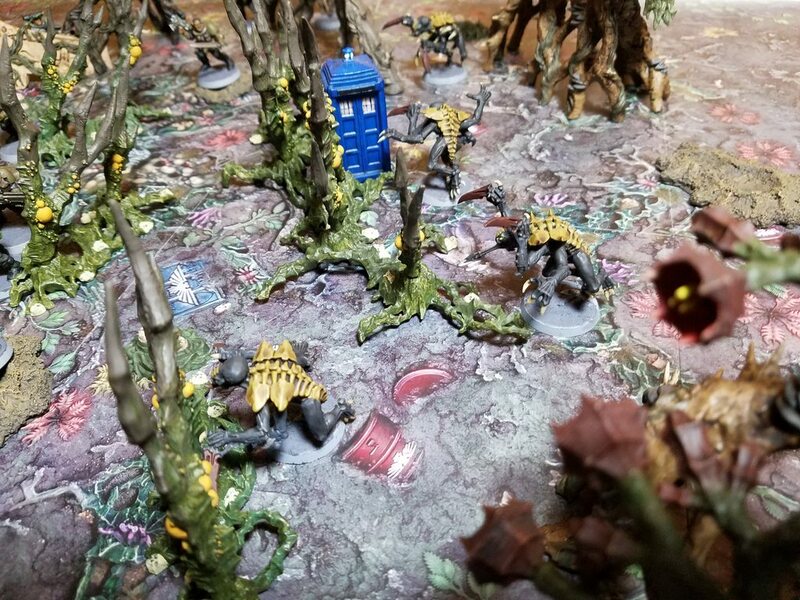 I don't know if I will bother with the rules yet, but this blog is only dealing with miniatures to create the feel of a squad scouts crashed on a deathworld jungle attacked my tyranids. To accomplish this I have a bunch of Scouts, Tyranids and Kill Zone: Death Forest terrain. The scouts are painted in the Raptor Chapter (Raven Guard 2nd Founding Successors) that I made for my friend who I sometimes play miniatures war games with. This part of the project is nearly done as I had a full kill team before even starting the project. I did pick up a few more scouts to add more options to the kill team without sacrificing aesthetics of an all scout squad. I just couldn't bring myself to add Primaris marines as they were just too big to fit in with spec ops team look that these scouts had. It took while for me to settle on which Hive Fleet color scheme to go with for my Tryanids Kill Team. I came really close to going with Hive Fleet Moloch as I like the devilish look of red and black on tyranids. However, I felt I have too much red and black factions as is so I wanted something a little different. I also considered going with my Space Hulk genestealer color scheme which is a gray scale look to give them a 50's monster feel. But I didn't think that would look right on the death forest board. I decided on Hive Fleet Jorgmungandr as that had the dark palate I was looking for and already matched carapace I have for my genestealer cult which had a deep mining background. I don't have full idea how I am going to paint these tyranids. I am still considering a dark brown dry brush on the dark grey parts as well as a dark green-black with the yellow part. I haven't decided if I am going to go for a yellow-white or metalic silver for the teeth and claws. The silver worked really well for my space hulk genestealers, but I don't know if it will with these ones. 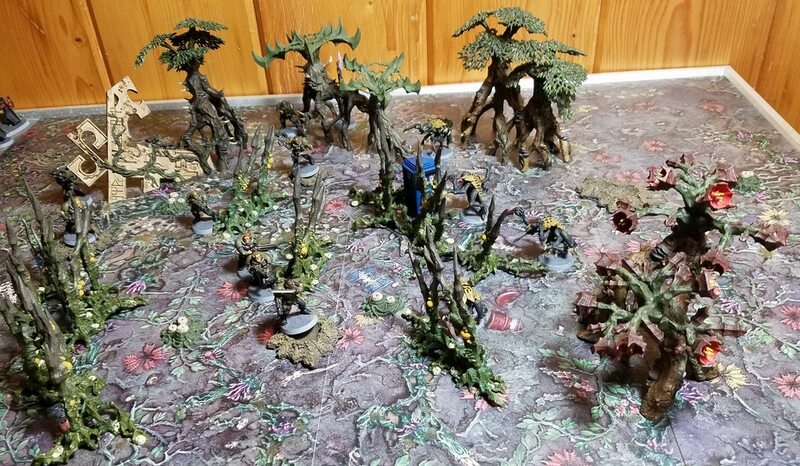 I have the terrain from Killzone: Death Forest as well as bit from the Dark Eldar Kill Team Starter. Most, but not all, of it is built. I think I have enough at the moment for the project, and the project already had quite a bit involved with it so if I don't get to the last bit of terrain before the end of February I am okay with that. I also have a bit of scatter terrain from various sources that I plan on using, but that is done and there to mostly add more variety to the board. My plan with the Death Forest terrain is to go with dark colors. I want the board to have a gloomy Pacific Northwest rain forest look to it. Well, as much as alien plant terrain can have anyways. That is not to way it will be completely devoid of color, just that I plan to have it much darker than what GW went with. That is the introduction to my project. I hope to have everything to tabletop standard by the beginning of March when I can probably get my friend to play a game. As elements get completed or I have thoughts on this particular project I will make additional posts. I also want a weekly post around the weekend where I can go over any progress accomplished during the week. The Scout kill team is complete. If I have time after I get a good chunk of the other portions of the project done, I might go back and do a little highlighting and detail work on them, but I am pretty happy where they are at now. So if do find myself behind on the other elements, the scouts are good to go. I really like how the scouts turned out. To look at them, you wouldn't know that I modified the hair on some of them to better fit the ethnicity I was going for. I especially like the front rank bolter scout who I think really looks like Dwayne 'The Rock' Johnson. I also really like the look of Raptor Chapter Scouts. Although, I don't know if full space marines or Parimaris would look as good. I think the Raptors tactical doctrine give the space marine chapter the feel of special forces that works well with the scout model. I almost want GW to put out another scout team with grenade launcher, plasma gun, etc. to allow pretty much any Adeptus Astartes weapon to be usable with scouts just to further expand this kill team. Yeah, the Scouts look good! The Raptors' color scheme works really well for them, though hopefully you don't lose any of them while playing on the jungle board! I'm looking forward to seeing the project completed, I like the Lost Patrol inspired approach. That’s when you know you have painted a good camouflage scheme. I once lost a marine I was painting for a competition because I painted him to be hidden. I placed him on a shelf with a bunch of terrain and got pulled away for a few days. Forgot I had moved him from my painting station and spent days or weeks looking for him . Thank You very much. I used to play Dust Warfare and Bolt Action so military colors are something I have some experience with and plenty of paint colors to pick from. I have played games where a squad of mine that were forgotten for a couple rounds before I remembered I fielded them somewhere. I kinda want to go back and actually camo the cloaks and maybe give a couple of the scouts camo face paint. I have done several types of camo schemes before, but I only like about half work I have done and more modern woodland camo patterns is something I can never quite get to my liking. So I don't know. As for progress, I have managed to finish up a few pieces of terrain. The photo makes them out to be a little brighter than they are since I have a spotlight shining directly on them and they don't have a dullcote on them. The Ruins one still needs a little more of the vines painted and a wash. I should probably go over everything with some more dry brushing as well. I like how the flower things turned out although I got a little too thick with the paint on the inside trying to rush it a bit. I debated on the color of the mushrooms-fungi things on the trees and went with grey as something a little more striking than a lighter shade of brown which would probably be more accurate to the fungus they are trying to be. I don't know if I am going to do much more with the yellow boils. I haven't quite decided if I will put a wash on those plants or leave them as is. I do think things are coming along nicely. I think I could use a little more finished terrain and I could take some nice pictures of the scouts traversing through a dense alien rain forest. Not much to update. I managed to finish building the rest of the terrain for this project. Also put the initial coat of paint on everything and can get a good idea the max density on the board. I think it is a pretty good amount. Much more and it will get tough to move the units around if I haven't crossed that already. I also tried to see how well this much stuff created LOS blocking areas. It creates a few spots here and there. Not as much as I would like though. I think I will try a couple games as is then decide if some count-as LOS blocking rules are needed. I might just need them for speeding up the game play instead of trying to determine where and when is actually exists. The flowers do look really neat like that, probably my favorite part of the terrain! Looks good! I'm interested in getting some of the Deathworld terrain at some point, nice to see it in action. If you want a simply way to make some LoS blocking terrain, why not mount a couple of the trees on low hills? Something just tall enough to obscure LoS for most GW infantry figs, 35mm high or so. amazingturtles wrote: The flowers do look really neat like that, probably my favorite part of the terrain! They are also my favorite. They still look like flowers, but have a strange barely preceptable deadliness to them the way they were sculpted. Haighus wrote: Looks good! I'm interested in getting some of the Deathworld terrain at some point, nice to see it in action. I thought about adding a small hill I already have into the terrain for this board. However, I don't want to permanently mount anything or make more terrain. I already have other Kill Zones to work on after this project so I don't want to get too bogged down making even more terrain for this project. Besides, Kill Team is a pretty small area, and I have a lot of terrain for this particular board already. Besides, Kill Team doesn't exactly reward hanging back and shooting all game like it does in regular 40k. This board is almost always going to give a cover bonus even if the units are only a few inches away. I see introducing LOS blocking house rules not as balancing factor but more of a not spend a couple minutes trying to see if there is a target or not. Which I see being a big time waster with a board like this even if there are couple of spots with hill completely blocking LOS. Heck, I was really worried about it I could throw a rhino or two on the table and just say they were over grown with vegetation (or get some aquarium plants) too. I have even thought about getting some medical guaze, shredding it a little and placing in and around the trees to make them a little more solid. Like I said, I am not too worried about it since I expect this board will be mostly me and my friend with me playing a Genestealer heavy Tyranid team vs. his long range scouts team. Thanks for the suggestion though. I have a few Genestealers painted up. I decided to keep it simple and just stick with the dark gray and yellow color with a brown wash. I have also managed a few more terrain pieces but I think I am at the point where additional pieces are going to fill in the board more but not really look different in a photograph save the Venus fly trap ones. I am getting a little burned out from painting this terrain so I will probably focus more on the Tyranids or some other kill team that needs a little more painting. All in all, I am happy with the final result, but don't want to do any dry brushing/detail work on the terrain any time soon. Big fan of the raptors. Good work.